Interested in experiencing Detroit Head Start for yourself? Fill out the form below to schedule a classroom visit. By visiting a Head Start classroom, you’ll get to meet educators and observe what it’s like to work at Detroit Head Start. Please fill out the form below to submit your scheduling request. 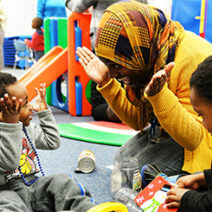 A Detroit Head Start representative will follow up with you to arrange a visit time. Please note: your visit is NOT CONFIRMED until you hear from a Detroit Head Start representative.